Gizmo, Sprinkles, and Wild are fed up. Every time they build something with their blocks, Rex wrecks it! Whether it’s an out-of-this-world rocket, a magical heart, or the biggest, strongest, most awesomerific castle ever, Rex sends it crashing down with a “Rawr!” (and sometimes a sheepish“Rawry!”?). Isn’t there any way to make playtime fun for everyone? 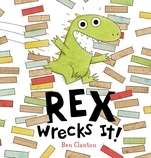 With Rex-size humor, Ben Clanton explores the challenges of friendship, the benefits of working together, and the joys of destruction. Look out! Here comes Rex! Children who love to construct — and those who love to destroy — will relate to this kid-pleasing tale that builds to a smashing finale.